Music Thinking is the quest for the ultimate remix and a mentality in meaningful collaboration. If we are aware of something new, that we recognise but don’t know what it is and can’t understand, we often tend to ignore it. Because it does not make any sense to us. This happens to us in business but also in our private life with our families and friends. Especially when we are getting used to certain things and though having more experiences (good or bad) we tend to fade out new information. We then focus on the common ground of what we can process and what we can verify as valid or valuable. In this way, we develop a blind spot for new useful things. The essence of the Understanding card is the triangle of recognising, understanding and criticising that surrounds the blind spot. It starts with the ability to identify something new, see new patterns and connections that help us to understand what it is or what it’s not. If we keep a feedback loop between our mental models and the new models that are turning up we can avoid criticising what we don’t understand. So in our ever-changing world, the most important thing is to keep track and be open because the times they are changing. The image is part of a bigger Japanese woodblock print (or triptych) of the Japanese artist from the Edo period Utagawa Kuniteru as is made around 1850. It shows a shakuhachi player with a Japanese bamboo flute. It looks like the three players are getting together for a session. The one on the right carries a Koto. The title is ‘Flowers’ (Hana), and the colourful ornaments are all over the print. It is part of the Rijksstudio collection of the Rijksmuseum in Amsterdam. Come mothers and fathers Throughout the land And don’t criticize What you can’t understand Your sons and your daughters Are beyond your command Your old road is Rapidly agin’. The quote is not a real quote but an excerpt from one of the most famous songs from Bob Dylan, The Times They Are a-Changin’ from 1964. It stands for a new generation, and Dylan recalled writing the song as a deliberate attempt to create an anthem of change for the moment. Bob Dylan was awarded the Nobel Price in 2016. It would have been to0 easy to also use The Times They Are a-Changin’ as a sonic trigger. 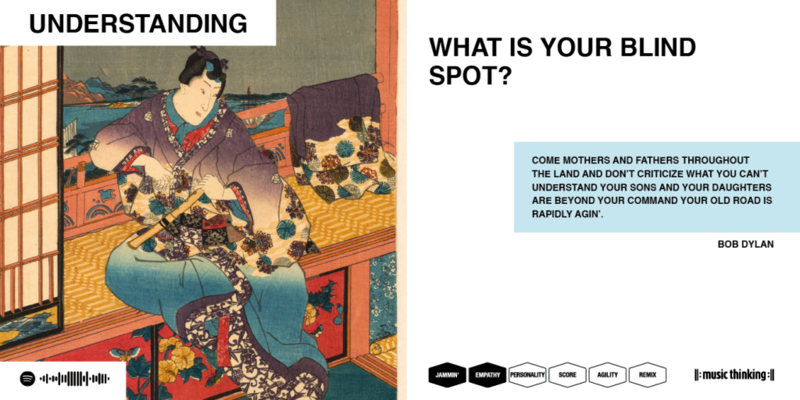 The song connects with the picture and ‘shows’ the sonic side of the woodblock print, the sound of the Shakuhachi. ‘Shin-kyorei’ is one of the “Bekkaku” (traditional three) pieces. In the Kinko school “Kyorei” means “spirit” or “Bell of Enlightenment”. If you listen to this song via headphones, you will hear all the side sounds that make the shakuhachi so rich and special. It is an ancient song that can give you unheard pleasures and calmness. To lighten up your blind spot and connect with something new, it might be a good idea to learn a (new) musical instrument. There are so many instruments to try out from electronic to simple, from iPad synthesizer to the Ukulele. So this brought me to the Shakuhachi, a flute with only five holes and totally different than our western instruments. I started practising the shakuhachi and learned that this is an instrument you play for connecting with yourself, your breath and everything that surrounds you. For me, this is every day a moment of connectedness, something that words cannot describe. This card is connected with the cues JAMMIN’ and EMPATHY, both cues are part of the listening step and stand for free creativity and also the connection with others. Please read ‘others’ even for everything that surrounds us, nature, living beings and our planet. An inspirational card set for change makers, pattern recognisers, innovators, transformers and natural collaborators. 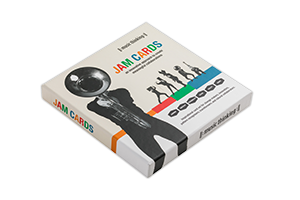 The Jam Cards consist of 38 inspiration cards and six cue cards. All inspiration cards have a keyword, a visual and a sonic trigger, a trigger question, an inspirational quote, and six cues that connect with the Music Thinking Framework. You can use the cards from a strategic point of view, knowing what you want or need and a serendipity approach open to everything that will happen. ‘Music Thinking’ lets people work and play together in a new way with inspirations from the rich world of music. Order the Music Thinking Jam Cards.